Nyman class of ’92. And I pronounce…. An interesting twist lies behind this disc: all four compositions were “written in the six months between 12 February 1992 (…) and 12 August 1992” – and one can add: all were recorded between 12 June 1992 (“Self-Laudatory Hymn of Inanna and her Omnipotence”, John Bowman and Fretwork) and 21 November 1992 (For John Cage by London Brass). Nyman adds that he composed a few other pieces as well during that time-span, two duets for his opera “Letters, Riddles and Writs”, a song “Mozart on Mortality” (doesn’t that sound enticing?) and The Upside-down Violin. With such a prolific output (that’s about the number of works Henry Dutilleux would have composed in ten years! ), one may have feared some vagaries and troughs in inspiration and quality. I don’t find so. I’m not always well-disposed towards Nyman and his brand of repetitive minimalism and dance music, especially when he relies too heavily on predictable, clichéd and saccharine harmonies, but here I find all four works both exciting and maintaining commendable musical and stylistic diversity. The most striking I find is the first, Self-Laudatory Hymn. It derives from Nyman’s discovery (on 12 February 1992, precisely) on a text from ancient Sumer attributed to the Goddess Inanna, “Queen of Heaven”, one of the major figures of the ancient civilization’s pantheon, also known as Ishtar among the Sumerian Semites. It ends with a long catalog of temples devoted to her. Because of James Bowman’s vibrantly incantational counter-tenor voice, it evokes Britten’s Oberon from Midsummer Night’s Dream revised by Nyman’s motoric and coruscating brand of minimalism. The accompaniment by the 5 viols of Fretwok adds its layer of appeal. Written for Virginia Black, Nyman’s erstwhile fellow student of harpsichord under Geraint Jones at the Royal Academy of Music, The Convertibility of Lute Strings is also an extraordinary, 15-minute piece for solo harpsichord, worthy of joining Ligeti’s Continuum among the best pieces written for the instrument in the 20th century. Nyman recognizes that the title bears no relationship with the piece itself – it doesn’t use the lute stop of the harpsichord and makes no overt reference to the past harpsichord literature. It refers to the practice of 16th century money lenders to offer goods in place of cash, for the borrower to sell and hope (hope always deceived) to gain the money equivalent of the sum borrowed: and lute strings were a valued substitute commodity. The piece inhabits more somber corners than Nyman’s usual music, it is very dramatic, relentless (and does evoke at times a piece late Ligeti might have written), and requires huge stamina from the performer, which Black provides. 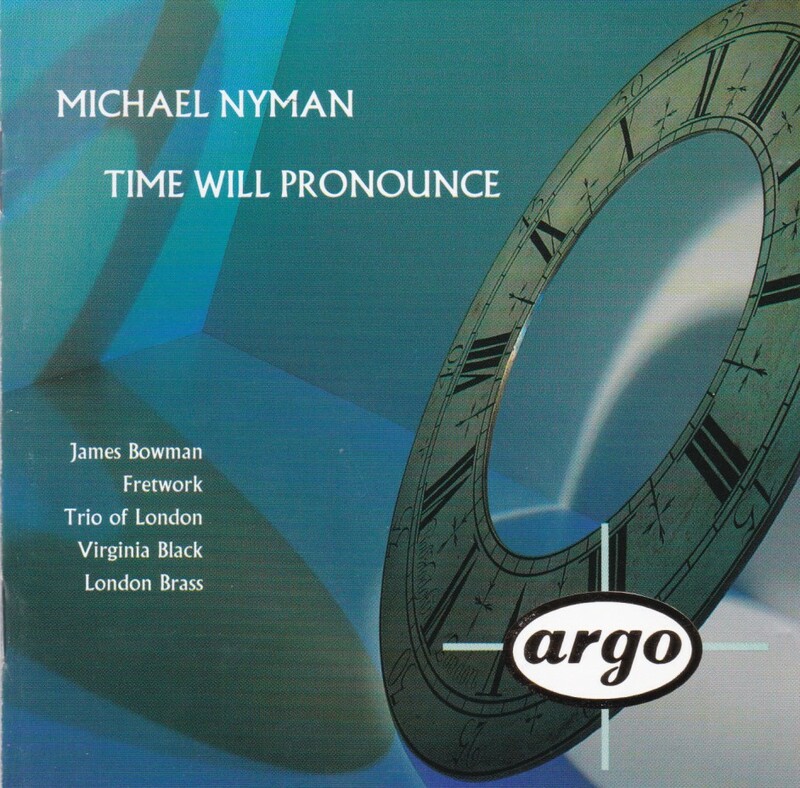 It must be another twist of Nyman to give his pieces titles that bear only little if any relationship to the music. Nyman’s composition for Brass Ensemble is titled “For John Cage” only because Cage died the day the piece, still without title, was completed (Nyman learned the news the next day reading the newspaper). Nyman pays a moving tribute to Cage in the liner notes, calling him “the most revolutionary musical thinker of the twentieth century” – you wouldn’t necessarily expect Nyman to place Cage so high in his own pantheon, and I wish he had developed more the idea. Maybe he meant that Cage was the one composer who helped all others break out of it – the cage of accepted notions? Nyman offers another oblique link of his piece with the un-caged composer: “his influence on my music may be perceived under the very un-Cageian surface: though stylistically there may be litte in ‘For John Cage’ that may have been to his taste, I hope he would at least have appreciated its diversity, and its non-simultaneous multiplicity”. There is in fact an up-beatness and coruscating ebullience to Nyman’s brass piece that evokes American music for brass band. While the three previous pieces run around 15 minutes, “Time Will Pronounce” for piano trio (played by the Trio of London) is the longest one on the CD, adding five. The title is derived from the concluding line from the poem “Bosnian Tune” by Nobel Prize Joseph Brodsky, not so much, as Nyman says in the liner notes, about “the unnecessary, unacceptable daily deaths in Bosnia during 1992 (and still 1993)”, but on our indifference to those deaths – the notion being that Time Will Pronounce that the indifferents – us – are accomplices of the murderers. After various failed attempts at fostering diplomatic agreement between the conflicting parties (in 1992, paying a short visit to besieged Sarajevo, French President François Mitterrand, a notorious friend of the Serbs, justified his refusal to deliver weapons to the Bosnians by pronouncing “one doesn’t add war to war”), Nato intervened in 1995 after the massacres of Srebrenica and Makale and put an end to the war. Nyman doesn’t explain how the music is related to the title. Possibly it was written as a cry of reaction to the ongoing situation in Bosnia. The music is indeed vehement and exacerbated, intensely lyrical – not always somber though, sometimes very upbeat and dance-like (6:56, 14:40), pitting strings (usually playing as one unified instrument rather than two separate ones, often very legato) against piano (more percussive). In fact it is in that piece that I hear the most stylistic traits that would fit the description “repetitive minimalist” or “dance music”, often associated (including by myself) to the music of Nyman, it isn’t so striking in the others. Every episode in the Trio has something impressive and striking to offer, but I do find it a little long perhaps in its accumulation of episode after episode of exacerbated lyricism whose logic seems to be only that imagination kept flowing from the composer’s pen. Wild growth is good, but there’s a value to trimming too, as all gardeners will tell you. Already a quarter-century! 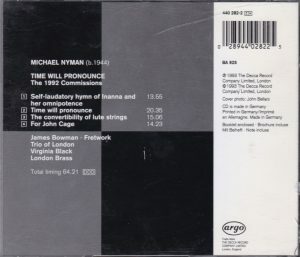 I’m not Time and there’s no telling what posterity, after Nyman’s death and mine, will make of 20/21 century minimalism and its developments, but for it’s worth I do pronounce this CD very entertaining and valuable. TT 64:21.